Maritta slammed the door and slammed down the crossbar. It landed with a solid thud, barring her family's door and protecting them from The Rakdos outside. The guild was on parade, filling the streets with a dreadful cacophony of dragging chains, mad cackling, and the screams of agony by those who were swept up in their gruesome marching carnival. Maritta crumpled and fell with her back to the wall, reaching out to pull her two children close. She whispered soothing words to her terrified children, trying to reassure them that they were safe now from the monsters stomping past their home. The mob paraded by, filled with deranged glee. Homes, businesses, temples, and even government buildings, closed and barred their doors as the vanguard of the Rakdos approached. It was a terrifyingly long procession, composed of almost all of the Rakdos guild's ranks. Amidst the bloody parade, the carnival was in full swing with bladed stilt walkers, a mobile aerial-chain act, body-pierced high-flying trapeze artists, and other ghastly sights. Every member of Rakdos carried a murderous grin, being deliriously happy, for today marked the beginning of their Slaughter Games. The competition had been announced as three of Rakdos' rings battled over a recently vacated territory, and to make the most of the conflict, it was put up as prize for this Slaughter Games. The Slaughter Games consume the guild for as long as it takes, until the victors stand bloodied but victorious. 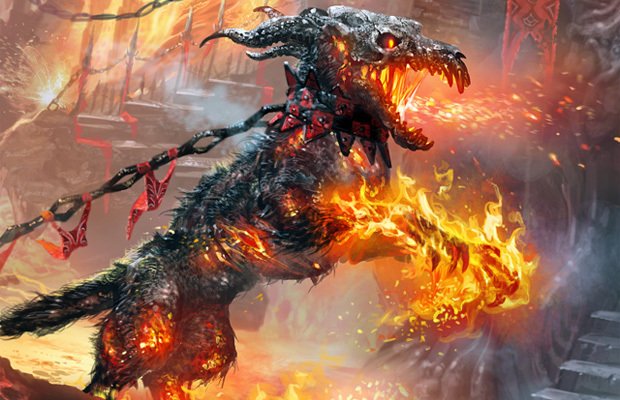 Only a fraction of the Rakdos followers will the games, to do so is to put life and limb on the line. They willfully put their life at risk for the spectacle of the games out of devotion for their demonic leader. Darux had been a champion Spiker for four years' Slaughter Games, though the games aren't annual, so he had actually been a winner through seven Slaughter Games, until last year when he was dethroned by an upstart from Massacre Girl's ring: Vildika. A tall and tightly corded female human, who got the killing blow on a particularly agile victim that had dodged Darux's deadly swing of the hammer, only to be caught by one of Vildika's bladed boots in a graceful spinning kick. Darux found himself defeated and Vildika crowned champion for the year's games. 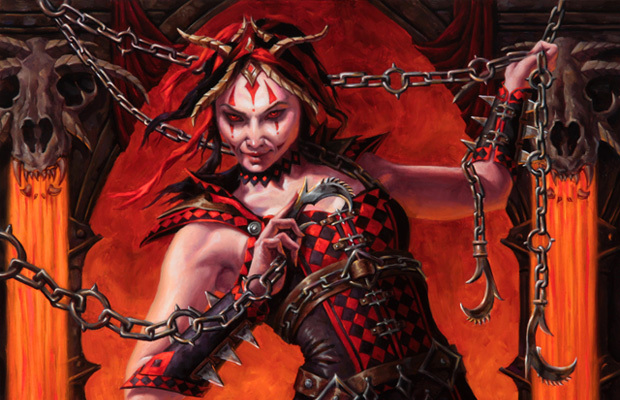 Darux's previous ringleader was the very unusual Stroko, a goblin who devoted himself to Rakdos. Stroko had made good use of Darux as a Spiker, he kept the little peace which benefited Stroko and caused the chaos which would further Stroko's goals. After Darux was defeated he was worthless to Stroko and with great derision he insulted Darux amidst a Slaughter Games feast. Darux, outraged, rose to his feet so quickly that he knocked over the feast table, scattering food and drink everywhere. He tore off his vest that bore the sigil of Stroko's ring and threw it down before storming out. He would start his own ring. He left the tent alone. Many bristled at the poor treatment of Darux, but none had been outraged enough to follow him during his exit from Stroko's ring. It had taken him some weeks, but he had grown his own upstart ring. Darux had battled for territory and carved out a niche not too far from the festival grounds. Finally, the Slaughter Games had arrived once again and Darux now marched past Maritta's door, his ring marching around him. He wore a vest with a sigil of his own on his broad shoulders. He hung chains of his status around his shoulders, using large links to intimidate all who beheld his already massive frame. Further, he carried his spiked hammer on one shoulder, with his other hand leading the chains of his ring's supplicants. Darux may be a spiker, a pierced titan towering over the members of his ring, but he had discovered he also had a good mind for business. As angry as he was at Stroko's insult, he had learned a good deal from him. As chaos and frivolity reigned among the cult's ranks, it was the higher ups who were tasked with carefully managing it to the prosperity of all. 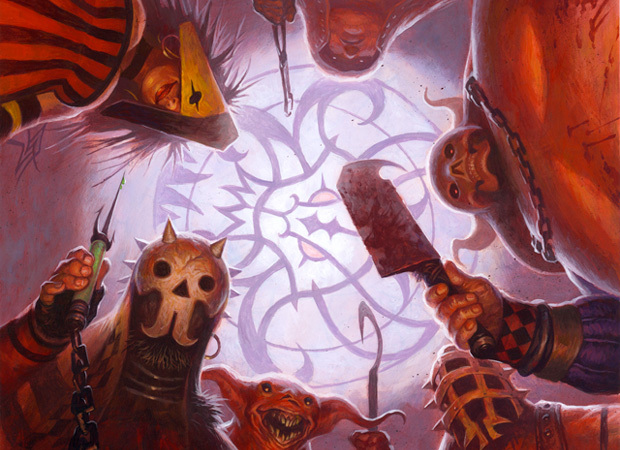 It was up to the ringmasters to organize, fund, and let the carnival continue in order to please Rakdos himself. 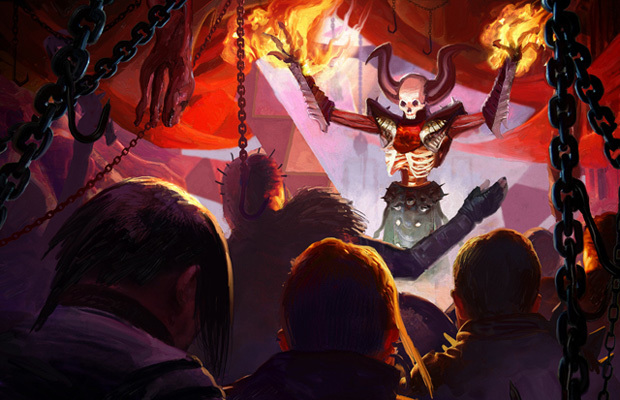 And though he did not appear, every ringmaster knew that Rakdos watched these games with interest. Because of this, Darux hoped to find his ring elevated after they proved themselves at the Slaughter Games. Only a few weeks ago he had recruited Vildika away from Massacre Girl. She walked beside him now, head held proudly high. She wore a form fitting and low cut dress with rows of piercings on her delicate features. In just these few weeks since her arrival Vildika had proven herself a valuable ally and confidant in the matters of the ring, and he had found himself falling for her. As the ringmaster, Darux had begrudgingly chose not to compete, instead allowing Vildika to represent his ring in the games. He bristled as he thought how he would be a spectator this year, but he also knew that it was for the best. He was earning Rakdos' approval through his work outside of the arena now. As the enormous archway into the festival grounds neared he looked through it's high arch and saw an apparent waterfall of blood. 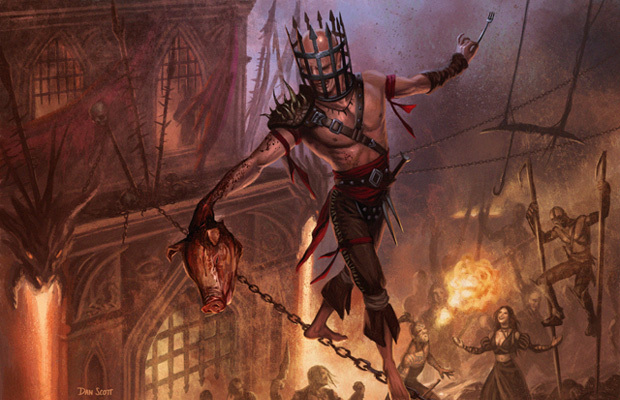 Animal, human, centaur, and perhaps even merfolk, any being who had been swept up in the pregame activities, was now used to welcome Rakdos' followers to the Slaughter Games. Darux grasped the spiked hammer in his massive fist and lifted it above his head as his ring entered the grounds, surrounded by shouts and jeers. Though the games were only for the strongest of wills, it drew countless onlookers. They stood on the edge of the grounds, quick to retreat and scatter for fear of suddenly finding themselves the latest plaything in the games. They had all come to see the horrifying games as they played out, and they were never disappointed. Darux led his ring to the area he had chosen for their camp, directing them as to where to setup their tents and hammer the stakes. Once the procession had finished and all the various rings were settled, dark had fallen on Ravnica. The fairgrounds were lit by numerous fires, and the normally loud and cacophonous guild had quieted somewhat as they prepared for the games the next day. The other ring members were gone and it was just Darux and Vildika sitting together next to the fire. Darux sharpened his spiked hammer before slamming it down on the remnant carcass of the beast that had been their dinner, testing it's point. Vildika had removed her boots and was reclining next to him, pricking her fingers absentmindedly as she watched the blood well. "Do you miss Massacre Girl?" Darux asked questioningly between strokes of the whetstone. He was honestly curious. She had joined him willingly but he knew also that they had been close for many years. "I mean her, and her ring." Showing little emotion Vildika replied, "Rarely." And after a moment's pause she added, "I joined your ring because it was clear that she no longer saw me as anything but a combatant in the games, a trophy. I was her trophy to parade around, not a member to share the carnival with." Emotion had crept into her voice as she spoke, anger intermingling with sadness. Darux considered her response, it wasn't unsurprising. It was common for ringleaders to take their Slaughter Game victors and raise them onto a dais. Stroko had done the same to him for years, but in those times he had enjoyed it. He was celebrated, known, and he had whatever it was that he wanted - except for closeness to anyone but Stroko. Oh sure he had companions to enjoy the bloody carnivals and circus, and he never wanted for much, but he had had plenty of time to reflect back on who he had been and compare with who he was now. "Are you ready to compete tomorrow?" Darux still could not hide the fact he wished he was in the competition. Vildika's sharp laugh rang through the ring's tents, "Have you seen the spikers from other rings? They're pathetic. Even Erzadalt, that hulk that Reneir has been grooming for years. He's hardly ready and I'll strike him down without a worry. It almost doesn't seem sporting this time around." She pricked her index finger in three quick motions, watching the blood well before it slid down her finger into her palm. Darux nodded, he had felt the same way for many years, completely confident in his victory. And even last time he had been confident in his victory, at least until Vildika surprised everyone. "How much did you wager on me?" Curiosity clear in her voice. Ringleaders always made wagers with one another over the games, sometimes for money, sometimes for people, and sometimes for promises. "More than I did on anyone else." Darux had wagered across all of his combatants and games participants, but he had wagered the majority of his ring's stockpile on Vildika. A move his moneykeepers were none too happy with. Vildika, pricked her finger one more time and clenched the bloody fingers into a fist. She allowed herself to smile. Tomorrow, the games would finally begin.